Underwater grasses and a crab pot near Crisfield, Md. 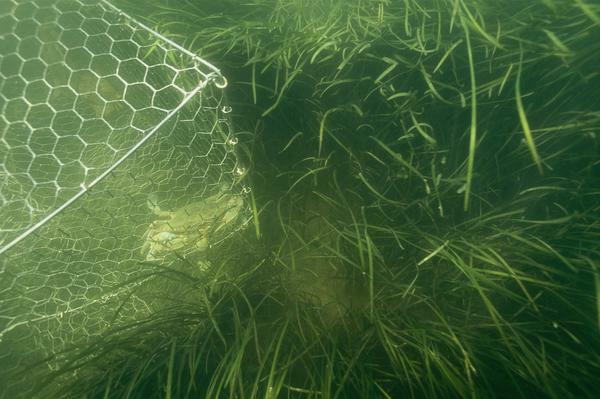 In the Chesapeake Bay, underwater seagrass beds are growing, sheltering crabs and fish. The long-awaited recovery depends on efforts by farmers to prevent nutrients from polluting the giant estuary. "We have seen the development of [seagrass] beds the last few years where we've never seen them before," Orth continues. "So the plants are telling us that the conditions are improving." This week, Orth and a dozen other scientists published results from years of monitoring seagrass in the Chesapeake. And the news is good. The area covered by beds of seagrass has expanded dramatically over the past 30 years. There have been setbacks during years, but Jonathan Lefcheck, the lead author of the new study, from the Bigelow Laboratory for Ocean Science, says they were caused by short-term changes in weather. After accounting for those effects, he says, there's still a long-term trend of increasing seagrass cover. What's more, he says, this trend is clearly the result of success in reducing the amount of a particular kind of pollution: nutrients like phosphorus and nitrogen. There's been a long-running campaign to reduce this nutrient pollution, and much of it has focused on farmers in Maryland, Virginia and Pennsylvania whose land drains into the Chesapeake. Those farmers use those nutrients in their fields in order to grow lots of crops. Some of them also have to find ways to dispose of huge amounts of phosphorus and nitrogen in the form of manure from their chickens and cows. Federal and state governments have paid farmers to adopt practices that keep nutrients from flowing into the bay. Farmers are planting "cover crops" to capture nutrients that otherwise might wash away, installing fences to keep cattle out of streams, and spreading manure only when it's likely to stay where it belongs. The government also has forced sewage treatment plants to stop releasing so much nitrogen and phosphorus. When nutrient levels are lower, algae don't proliferate, which means the water is clearer and more sunlight can reach seagrass on the floor of the estuary. "A small change in water clarity, and those grasses can expand to cover a lot more area," says William Dennison, from the University of Maryland's Center for Environmental Science, who is one of the new study's co-authors. Dennison says that expanding seagrass beds lead to a "positive cascade" of effects on the entire ecosystem, because seagrass offers food and shelter to many other aquatic species. "You go down into this [seagrass] bed, and you just sit still, and you watch the animals come out," he says. "We call it the secret garden [for] all kinds of little animals and small fish and baby shellfish that spend part of their lives in this underwater forest." In particular, seagrass plays an "incredible role" in the complicated life cycle of the blue crab, one of the bay's signature species, says Orth. Orth cautions that some areas of the bay remain in very ill health. "It's not perfect, but we are on this trajectory, and we can't give up," he says. Among the bay's defenders, in fact, there's a lot of concern at the moment, because the Trump administration is proposing to cut federal funding for the Chesapeake Bay cleanup by 90 percent.